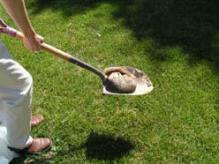 Here are some simple steps on how to safely dispose of a dead animal. 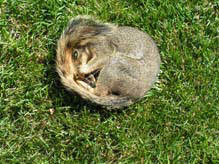 Do not touch the animal. 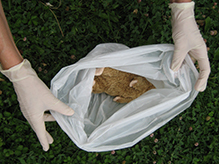 Use a long-handled shovel to pick up the dead animal and place it into a plastic bag. 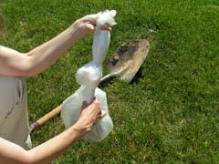 Put on gloves before handling the plastic bag. Tie a knot in the top of the bag. Place the bag with the animal into a second bag. Tie a secure knot on the top of the second bag. 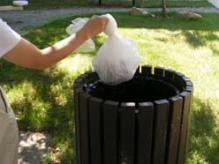 Dispose of the bag in an outdoor trash container. 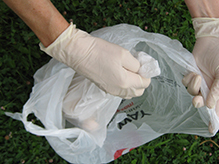 Remove the gloves and thoroughly wash your hands with soap and water.